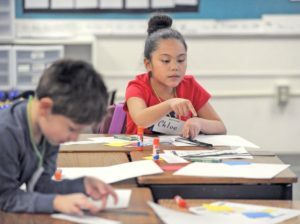 MOUNT VERNON — At Jefferson Elementary School, a group of second-graders know all about the works of artists such as Vincent van Gogh, Claude Monet and M.C. Escher. As part of the “Meet the Masters” program brought to the school by the Mount Vernon Arts Commission, students were learning Wednesday about the works of Dutch artist Piet Mondrian, whose use of lines, shapes and colors distinguished his art. The program has existed since the mid-1980s, according to its website, and has been held after school locally once a week for about two months, said Arts Commission member Andy Schuh. It seeks to provide adaptable, affordable arts education. 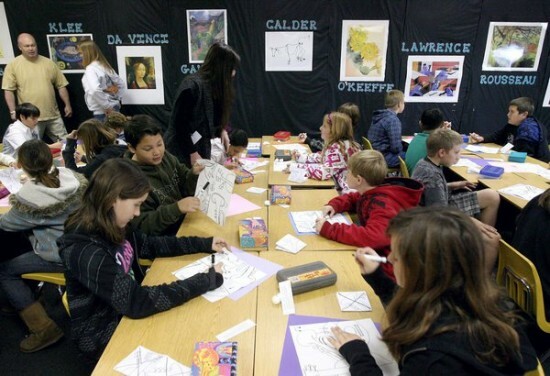 The Arts Commission paid for the “Meet the Masters” curricula, which includes art supplies so students can re-create the work of famous artists. At Jefferson Elementary, the program is open to second-graders, but each of the lessons can be adjusted to other grade levels, Schuh said. Amelia Anselment, 7, said she decided to take part in the program because of her grandparents and all the art at their house. “At their house, it’s very inspiring,” she said. Gabby Salaz, 8, said she wanted to attend the program because she loves art and learning. “It’s very cool, because you get to learn and learn and learn and I love, love, love it,” she said. The idea for the program was brought to the Arts Commission by Mount Vernon Mayor Jill Boudreau, whose children participated in the program when the family was living in California. Boudreau visited the class Wednesday and brought a piece of art one of her children had completed through the “Meet the Masters” program. The Mount Vernon students, she said, instantly recognized it as being in the style of van Gogh — the swirls gave it away. The Arts Commission is looking for volunteers to lead classes. Volunteers do not need art or teaching experience. For more information, contact Joni Swanson at the Mount Vernon School District at 360-428-6110. On Thursday, May 11, 2017 Village Elementary hosted its very first “artwalk” to exhibit over 800 masterpieces created this school year by students in grades TK-5 (transitional kindergarten through fifth grade) as they’ve participated in an art program called Meet the Masters. The program, founded by Bonnie Steele, features “historical, culturally diverse, standards-based art lessons to inspire young artists.” With thirty-five masters, including Picasso, Van Gogh, and Kahlo to name a few, students are exposed to the historical background of each artist and then given a chance to emulate each master’s signature style. As facilitator for Meet the Masters, Cyndi Fuhrmann has had her hands full serving as the liaison between the parent volunteers and teachers, but it’s evident that all the hours she’s put in have been more than worthwhile. She’s not only taken the initiative to organize the supplies by grade level, but she’s also trained parent volunteers, even those who initially possessed very little art history knowledge themselves. Cyndi has walked parent volunteers through the Meet the Masters program, showing them the three steps involved in the program and explaining how to prep the materials for each art lesson. When parent volunteers weren’t available for a Meet the Masters lesson in a particular classroom, Cyndi herself has rolled up her sleeves, happy to be the one to provide art instruction to the eager students. Other times, she has gone into the classrooms where her assistance was requested, working side by side with parent volunteers and/or teachers as they taught a Meet the Masters lesson, which takes place over the course of two days. First grade teacher Devon Roberts and Village Elementary’s Meet the Masters Facilitator, Cyndi Fuhrmann. First grade teacher Devon Roberts was one of the first teachers who was lucky enough to have the opportunity to work with Cyndi as Village Elementary was in the process of implementing the Meet the Masters program throughout the school. As a teacher as well as a parent, Ms. Roberts sees firsthand the merits of the Meet the Masters program. She shares a funny story about how her own daughter, who’s in kindergarten, was telling her husband all about “Andy,” as in Andy Warhol. When her husband asked her to elaborate about Warhol, her kindergarten daughter explained that he was known for his realistic art, including painting pictures of soup cans. “My five year old is coming home talking about Andy Warhol,” Ms. Roberts laughs. Parent volunteer Toni Brickhaus leading a Meet the Masters lesson. On this particular day, she was working with a fourth grade class, teaching them about a quiet artist named Georges Seurat, who was known for pointillism. On the first day of studying a new artist, students are exposed to a brief history about the artist as well as introduced to the artist’s style. Students are shown various masterpieces for which that artist is well known. “I love it as a teacher because it’s a program that’s ready. The parents are trained, and they organize everything, so it’s really a time when I can sit back and watch the process,” Ms. Roberts says. She shares that one of the aspects of the program that she particularly enjoys is that she herself, thanks to the parent volunteers, gets to take the time to watch the kids enjoy art, and because she’s not the one leading the instruction, she can really focus on absorbing how much art means to the kids, observing how thoroughly engaged her class is as they try to become masters themselves. After students in the fourth grade class learned about Georges Seurat, it was time for them to become the artists,. They first had a chance to practice the techniques Seurat used (top left), and then they created their own student art projects. “It’s so amazing that the PTO has done this for us, and that the parents do all the prep work to make it possible. It’s nice knowing that students will have this program TK-5 and that they’ll be exposed to art history throughout elementary school. I never had that,” Ms. Roberts reflects. “I think developing more well-rounded children is something that we can always get better at, and I think this program is definitely a step in the right direction. You never know which kid’s passion could have been art, but it was never tapped. We never know what kids will choose to do when they’re older, so I think this program is important because it taps into kids’ potential,” she says. Another important takeaway from the program is that art isn’t perfect. Students learn about the struggles that some artists, who are now considered masters, faced in their own lifetimes, how people laughed at their work and refused to buy it. Some of the masters weren’t even accepted as legitimate artists while they were alive, and as students learn about the artists’ personal lives, they begin to realize that no one’s opinion matters other than the artist’s. Van Gogh, who only sold one painting during his lifetime, painted more than nine hundred works. Students, who are sometimes critical of their own work, not only learn about the artists’ styles, but learn from the artists the value of perseverance and believing in oneself. “For a lot of my kids who need to be perfect, this program has helped them understand that as long as you try, it’s okay if it’s not perfect. That’s carried over into other things. For a lot of kids, that’s a really hard lesson, and I think this program does a great job with that,” Ms. Roberts says. On the back of each of the student’s Meet the Masters works of art is pertinent information related to the artist studied prior to creating the work of art. Cyndi remarks, “This program teaches each student that you’re allowed to have your own opinion, and you, in turn, need to respect other people’s opinions. You can like abstract art, but if someone else doesn’t appreciate it, that’s okay. Picasso did cubism, but if you prefer realism, that’s allowed. You’re allowed to like what you like, and there’s no right or wrong when it comes to art.” Cyndi equates learning new art styles to trying new foods. How are you ever going to know if you like something without trying it? Meet the Masters allows students to learn about new art styles, and then try it themselves. Even if it’s not their favorite style, it’s okay because they’ve at least tried it. As excited children entered the artwalk, with moms, dads, and even grandparents in tow, they eagerly searched for their own masterpieces, arranged by grade order from TK-5. Each student’s artwork was presented in true gallery fashion, with his or her first name, grade level, and teacher listed on the artwork’s mounting. Parents took pictures of their children as they posed next to their artwork, and it was fun watching kids not only take pride in their own art, but also pointing out their classmates’ pieces with admiration. Samples of some of the Meet the Masters artists’ work that students studied this year were hung alongside the students’ art, and at the start of each grade level, a sign was posted (on an easel, of course) that indicated the names of the artists studied by that grade level. As people weaved their way through the artwalk, it was evident how impressed they were with the quality of artwork produced by the elementary students. Long gone are the days of stick figures and arts and crafts – this was a serious display of high quality pieces, any of which could easily be framed (and most likely will be framed once portfolios head home). Chris and Sally Harvey’s sons enthusiastically showed their parents their own masterpieces that were on display. Of course, no celebration could be complete without pizza, and the PTO was there to graciously host dinner, free of charge. (They even threw in some carrots to ensure kids ate their vegetables.) After going through fifty-one large pizzas, there was no doubt that there was a substantial turnout for the inaugural artwalk. While parents enjoyed a night where no one had to cook, children played with their friends. Inspired by all the beautiful artwork they had just witnessed as they strolled though the artwalk, the budding young artists felt compelled to keep creating more art, brightly decorating the sidewalk with festive images crafted with chalk. PTO President Nicole Ashmore and PTO Communications Secretary Toni Brickhaus helped pass out slices of pizza and carrots. The first artwalk was definitely a success, and it’s apparent that the combination of Meet the Masters, students with an enthusiastic willingness to learn about art, and a steady stream of parent volunteers have created a masterpiece of their own at Village Elementary! 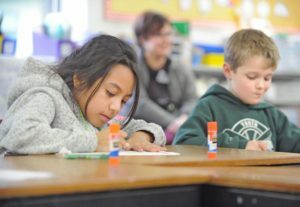 Thanks to an art program called Meet The Masters, put on largely by volunteers with support from the school and grant funding, students at Rancho Elementary are learning about famous artists and putting their art techniques into practice. The Orange County-based Meet The Masters has introduced students to famed artists —- from painters to potters hailing from several counties —- such as Claude Monet, Vincent Van Gogh, Maria Martinez, Piet Mondrian, Henri Matisse, Leonardo da Vinci, Gustav Klimt and Pablo Picasso. 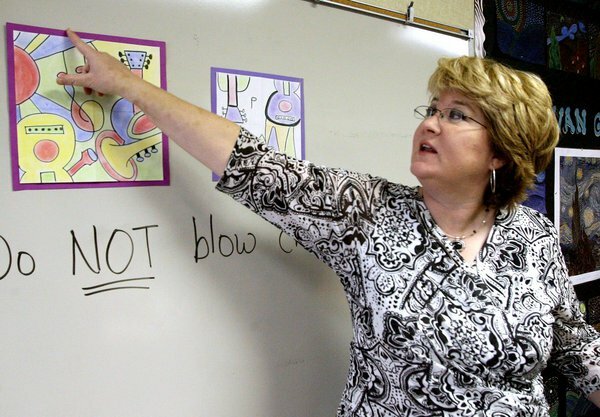 At Rancho Elementary, volunteer Elizabeth Harrigan, the mother of twin fifth-grade boys at the school, has led the program for the last two years, offering art instruction with the help of other parent volunteers. The art lessons, held in the school’s art room and offered to students in all the grades, follow an hourlong assembly hosted by a Meet The Masters staffer who uses a slideshow and art samples to teach the students about the artist and his or her techniques. The program at Rancho is a mixture of art appreciation and application. In the week that follows the assembly, Harrigan and the other trained volunteers, with help from the classroom teachers, bring out the art supplies and the students get to work. The students have used a range of mediums including oils, chalks, pastels, pens and clay, as well as printmaking. Their school’s program includes the introduction of five different artists each year. Last week, students attended an assembly about Picasso and learned about his different periods of works and his unique abstract and avant-garde style called Cubism. In the art room, students are creating Picasso-like drawings using pens and chalk, an art medium most students said they haven’t used before. “I don’t want to see two shapes touching each other in the same color,” Harrigan instructed the fifth-graders in David Cook’s class as they worked to color in an outline of a Picasso drawing Wednesday, following Tuesday’s Picasso assembly. Student Lorenzo Mills said using the chalks was a challenge. Students were instructed to create piles of chalk dust and then dab cotton balls into the dust to fill the color into the blocks on the Picasso design outlines. “They’re all over the place,” Lorenzo said of the chalk powders. Kayla Young was one of the many students who said they were enjoying the art project despite the messy chalks. “We get to express ourselves,” she said. Harrigan said she knows for a fact that the lessons stick long after the students learn about a particular artist. “This also gives them a chance to touch professional-quality art supplies, too, and just get a taste of what’s out there at a young age,” she said. Harrigan said she offered to lead the Meet The Masters Program at Rancho when she saw how much her two sons, Henry and Matthew, liked it. She also has a background in art, having been a hobby artist most of her life and working professionally for 10 years as an art director for a footwear company. “She is a phenomenal volunteer,” Rancho Elementary Principal Pam May said of Harrigan.